Something told me that I ought to like it, don’t know why. The band has labelled itself melodic death metal, but that isn’t the label I would stick on to their music. Well, fair enough, it’s that too, however it’s also punk-ish in the metalcore way and even holds elements of something I can best define as emo (even though the band’s probably going to kill me for that remark). Now I believe I’ve cracked it. It took some time, but ‘The Fury’ has worked its way under my skin and has grown into an album that I really enjoy. 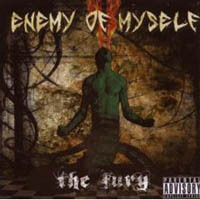 Enemy of Myself without a doubt holds a lot of talent. ‘The Fury’ has versatility, both in terms of the music and the vocal performance – growls, screams, clean voice, groove, melody, solos, artificial harmonics en masse and even acoustic guitar, it’s got a shitload of good stuff, the entire thing just had to sort of fall into place for me. I’m glad it did – you go ahead and try it.